A delicious, complementary food for baby rabbits which is also perfect for dwarf rabbits, because of its high nutrient levels and the animals’ high metabolism. It’s high in protein and fibre and rich in nutrients for strong, happy, healthy rabbits. Also, it includes mint. Grass, Oat Bran, Wheat, Soya Bean Hulls, Peas, Soya, Molasses, Yeast, Soya Oil, Mint, Ligno-Cellulose, Calcium Carbonate, Monocalcium Phosphate, Fructo-Oligosaccharides, 0.25%, Salt, Methionine, Vitamins and Minerals, Probiotic (Saccharomyces cerevisiae NCYC SC47 E1702 1 x 10^9 CFU/kg). Contains Natural Antioxidants. No artificial colours, flavours or preservatives. Cannot praise this product highly enough. It is definitely the best on the market. Our rabbits have thrived and enjoyed very good health for the past 8 years on this food with hay and fresh veg. 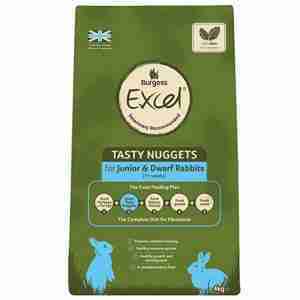 Our vet now stocks and recommends Burgess nuggets to other rabbit owners based on the superb condition of our rabbits. The rabbits love this food they cant get enough of it, if is one of the best on the market for nutrition. My Netherland dwarf bunnies love this food it is really good for their tummies, having prebiotic, and probiotic in it, they are lively and healthy on it.